I woke up this morning feeling hungry. Saturdays used to be my marketing/hawker food breakfast day but that hasn’t happened for a really long time. 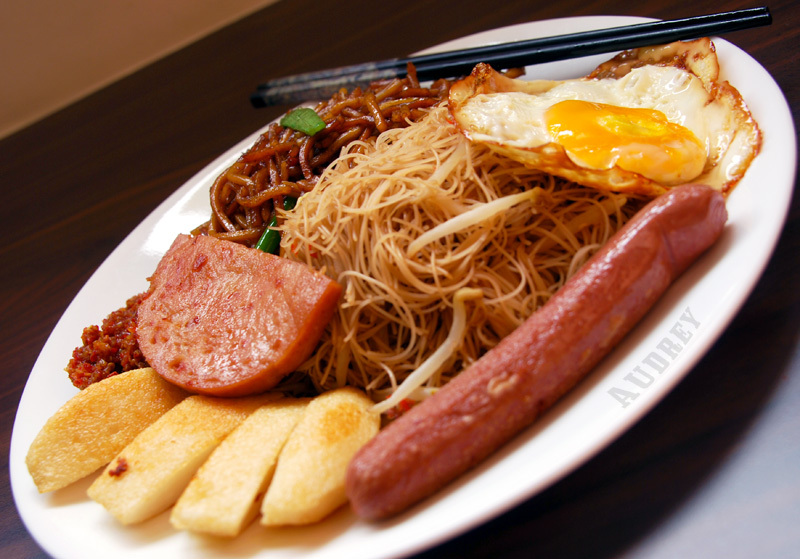 A typical cheap and quick breakfast would be the “Economic Fried Beehoon/noodles” that usually comes with a slice of spam or luncheon meat, a fried egg and fish cake. Sad to say this lists as one of the top unhealthy breakfasts in Singapore as it is supposed to have 935 calories (about 40% your daily caloric requirement), 46g carbohydrate (about 1.5 times my own carb allowance per day) and 1351 mg sodium. For $2-3, this breakfast may cost you quite a bit down the line weight and health-wise. 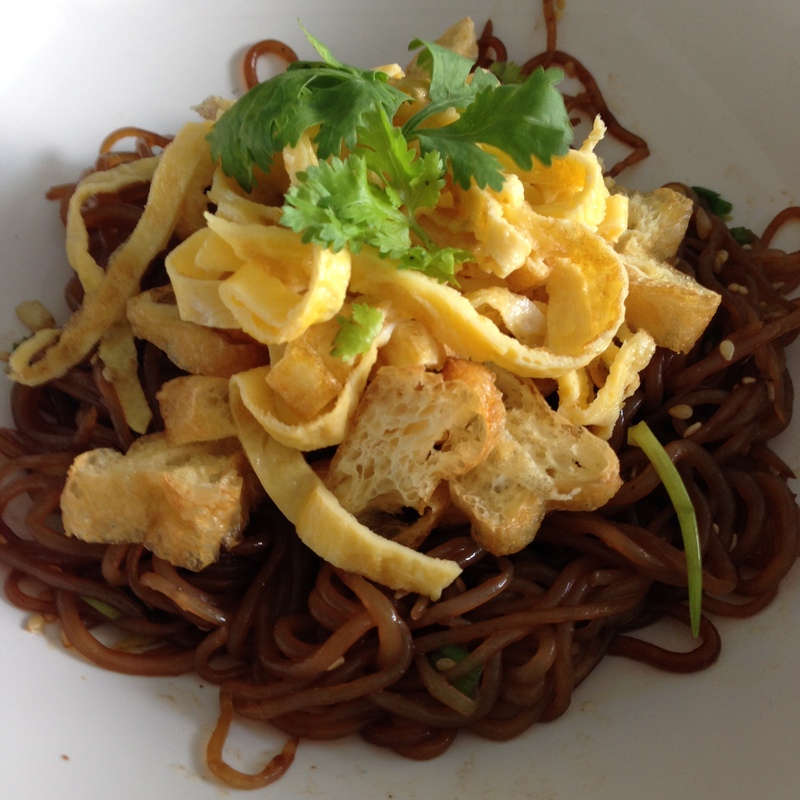 So here is a bit of a spin on breakfast noodles. 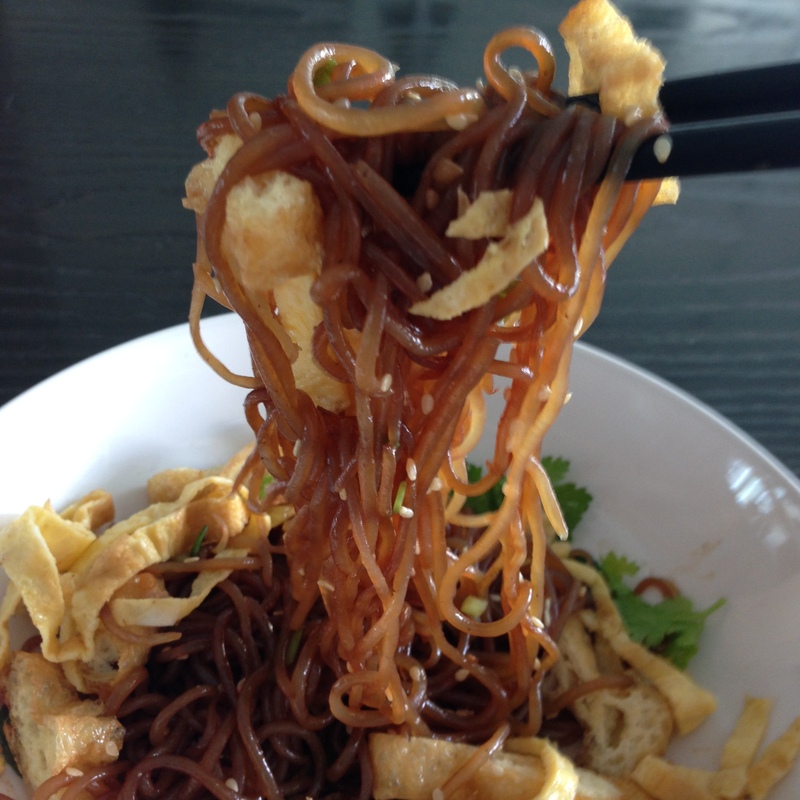 As usual the trick is using low-carb shirataki noodles which usually only have 3 – 4g of carb per bag. Also for low carbers, eggs are your friend and a simple egg omelette would only have 0.4 g carbohydrates. The tofu puffs I use only come up to 1 g carbohydrates for 10 puffs. So ultimately this low carb noodle recipe would only be 1/10 the carb count of the typical economic breakfast noodles you would get in the market and 1/3 of the calories. Not bad yes? A note to those who can’t do without the luncheon meat/sausage add ons to their noodle breakfasts. Luncheon meat (popularized as Spam) is a kind of pre-cooked canned meat that came to popularity in the impoverished period after World War II. In certain countries like Korea, Spam has become a cult item with people sending hampers of Spam during festivals (the ultimate in spamming as Korea is the top producer and consumer of Spam outside of the US). I confess there is nothing like the Spam in Korean Army Base Stew (Budae-jigae) which is what I crave for when watching Korean movies! But Spam is a killer for the sodium and fat content and surprisingly may contain added sugars. So the short answer is to try to avoid these processed meats if possible. Speaking of processed food, supermarket shopping has also changed dramatically for me – for those who truly follow a low carb diet, you will find that you will be shopping at the peripheral aisles of the supermarket (the aisles with fresh meat and vegetable produce) as 80% of the supermarket or the central aisles all contain processed food. So in Singapore the wet market which sells most things fresh is actually the better place to go (I am getting to be such an Auntie!). 1 sprig of spring onions, white and green parts chopped. 1. Heat up oil in a non-stick pan. Beat the egg and pour into the pan in a very thin layer. Cook for about 1/2 minute and gently flip over, cooking for another 1/2 minute more. Place on a plate and roll up, then slice into thin strips. 2. Using the same pan, lightly fry the tofu puffs until slightly browned, then set aside. 3. Put pre-prepared Shirataki noodles (this should be drained, washed and dry roasted as described previously) into the heated pan. Add the light and dark soy sauce, sesame oil and sesame seeds and toss lightly for about 1 minute. Add a few dashes of ground white pepper and the chopped spring onions and toss further. Put into serving bowl. 4. Top shirataki noodles with the tofu puffs and omelette strips. Serve hot with your favourite sambal belachan. Estimated carb count for this dish is 5g and calories about 245 cal. 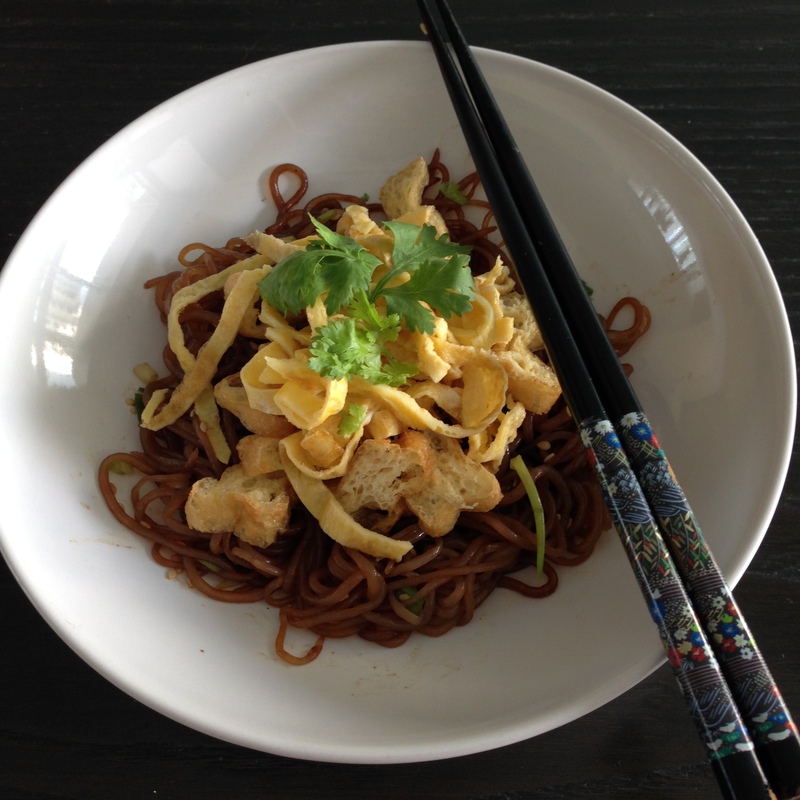 The use of dark soy sauce in this recipe renders a dark colour to the otherwise transparent noodles and gives it a richer and more assertive flavour.